Here’s an update on the strangest, and most fascinating, story I’ve written in all the years I’ve been writing on this blog. This story appears in the current — January 2019 — issue of Dakota Country magazine, where it reaches a hell of a lot more readers than I have on this blog. But for faithful Prairie Blog readers, welcome to 2019. There are a lot of threats facing our North Dakota Bad Lands. This is not going to be an easy year. We’re going to have some work to do to protect this special place on Earth. Here’s a strange story to get your motor running for 2019. We’ll have updates on refineries and other bridges as they happen. But first, here’s the story of Wiley Bice and his illegal bridge over the Little Missouri State Scenic River. A story almost as unlikely as the old TV series “The Beverly Hillbillies.” Remember them? You could haul a bunch of water, and you could really make a buck. We all remember (well, people my age, at least) sitting around the TV every Wednesday night following the antics of Jed and Jethro and Granny, and (boys my age at least) staring at Elly Mae busting out of those tight blouses and swimsuits when she sat beside the “ce-ment pond” after they retired to California. But not Wylie Bice. He’s not retiring to California. More importantly than getting an oil well like Jed — which I’m pretty sure he did — he got a truck. And then a couple of more, and he got some contracts to haul water for fracking oil wells. And more contracts. So he needed more trucks. He hired independent truckers and other trucking companies to haul water to the wells he had contracted for. Pretty soon he had 500 trucks hauling water. It takes a lot of trucks to haul the water to and from an oil well. 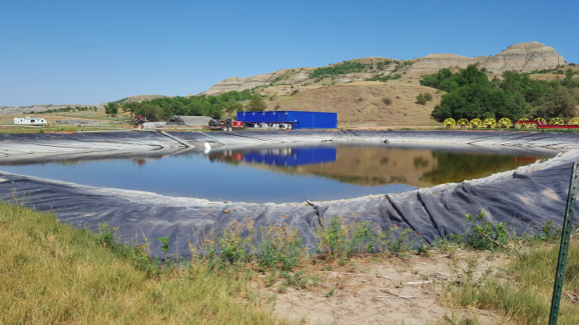 It would not be unusual for a single oil well to require 1,000 big tanker truck trips to haul fresh water to a well site for fracking and haul toxic waste water away from the site during the life of a well. And there’s a lot of wells being drilled. So with 500 trucks running, Wylie’s trucking company was only limited by his ability to get contracts with oil companies to haul water to and from oil wells. And he was pretty good at that. By 2012, when the Bakken Boom was really cranking up, Wylie’s company got noticed, and he got an offer. A Florida company, Quality Distribution, offered Wylie close to $80 million for his business and said they would give him up to another $15 million or $20 million if business continued to stay as good as it was when they did the deal. I don’t know how much, if any, of those additional millions he got, but I’d guess the first $80 million was enough to keep him going for a while. Wylie Bice’s pretty nice – and illegal – bridge over the Little Missouri State Scenic River. Photo taken from the east side (yes, I might have been trespassing, but just for a couple of minutes). That’s BLM land across the river. So while the Clampetts were content to retire and move to California, Wylie was having none of that. He liked being a rancher. His Bad Lands ranch was along the east bank of the Little Missouri, west of the Killdeer Mountains. There was a pretty nice ranch across the river, and Wylie had kept an eye on it, and after he cashed his big check, he went over and bought it. And as I have reported here before, he built a bridge to get back and forth across the river. A nice one. Probably cost him a couple of million dollars. The problem is, the bridge on the west side of the river is on federal land, managed by the Bureau of Land Management. So right now, the bridge is in place, and he doesn’t have permission to have it there. Or the road he built through the federal land to get to it. Wylie Bice’s illegal water depot beside the Little Missouri State Scenic River, on BLM land. There were no trucks loading water the day I was there. He also got a water permit from the State Water Commission and built his own “ce-ment ponds” beside the river — a pair of football field-sized, plastic-lined pits to store water pumped from the Little Missouri State Scenic River until his trucks could slurp it up and take it to a fracking site. The BLM didn’t know all that stuff was there until I told them about it in 2017. By then, it had been in place for almost five years, which means the Bureau of Land “Management” had not been out to take a look at the land they “manage” in all that time. I understand, there’s been an oil boom going on and they’re short of staff, but still, it ought to be a policy of federal land managers to take quick drive around their land from time to time to see if it is being abused by anyone. So the reason I am bringing this back to your attention is that about a month ago, I received a copy of the application Wylie put in to build a bridge — a bridge he’s already built. It’s the application I asked to see a copy of last February and was told to submit a Freedom Of Information Act request to see it, which was goofy because there’s nothing in the 98 pages I was sent on a thumb drive that bears any resemblance to a confidential document that could not be shared with the world. But I sent in my request last February, and nine months later, it arrived. Mostly what I learned and can share with you is that for the first time, Wylie is admitting he built a bridge on federal land without permission, and now, mea culpa, he’s asking permission. Earlier, he lied to the news media and said he thought he owned the land the bridge was on, even though two maps he submitted to the Corps of Engineers for a bridge permit clearly showed it was federal land. In case you read that somewhere, you should know he was not telling the truth. To his credit, he did get a permit from the Corps of Engineers to build the bridge. The Corps just assumed, and did not check, that he had permission from the landowners — the BLM — to build the bridge there. That’s a failure in the system. These agencies ought to be talking to each other. So now, the BLM has his application. But before it can grant him right of way for the bridge and the road to it, it is conducting a federal Environmental Assessment, which normally would have been done before the bridge was built, to see if this is a good place to put a bridge. The EA should be done pretty soon, maybe in the next few weeks, and we’ll get to look at it. Then the BLM will decide what to do next — grant him permission for the bridge, make him take it down or possibly sell him the land on which it sits to just get him out of its hair. The BLM also is going to fine him for putting the bridge, the road and the water pit there without permission in the first place. The amount of the fine should be part of the EA when it is done. Then it’s off to court, I suppose. And speaking of water pits, there’s been a spate of them built along the river since North Dakota Gov. Doug Burgum’s State Water Commission put a new policy in place last year allowing industrial use of Little Missouri State Scenic River water to frack oil wells, something prohibited by law until 2017, which has led to a substantial increase in truck traffic along the river, big old water tanker trucks that kick up huge clouds of dust. In October, I took Tweed Roosevelt, Theodore Roosevelt’s great-grandson, on a daylong trip to the Bad Lands on a beautiful fall day, and we decided to go take a look at the bridge site because it is near the place where TR captured the thieves who stole his boat in 1886, a great piece of Bad Lands and Theodore Roosevelt lore (see my notes at the end of this article). We were driving down a pretty good gravel road when a tanker truck pulled out in front of us, after just loading up at a new water pit beside the river. The truck was kicking up huge clouds of dust, and we were forced to slow down to about 10 miles per hour, and somehow in the dust storm we missed the turnoff to the bridge site, and before we realized it, we were almost to Highway 85 and the North Unit of Theodore Roosevelt National Park, our destination for the day. We didn’t go back, so Tweed never got to see the bridge. Maybe next trip. That dust, and what it is doing to the Little Missouri State Scenic River Valley, is what is going to be the problem with the new Burgum policy. It darkens the sky and settles on the grass, making the grass inedible for deer and other critters, including cattle. The oil industry is moving farther and farther south into the Bad Lands, closer and closer to the Little Missouri, and the availability of water nearby makes it even more attractive to the drillers. I’m very worried about the river valley, one of our state’s most valuable assets. “Well now it’s time to say good bye to Jed and all his kin. And they would like to thank you folks fer kindly droppin’ in. Yeah, there’s a lot of hospitality available to the oil industry in this part of the Bad Lands as a result of Wylie Bice’s bridge and Burgum’s policy. I’m going to keep writing about it, so you can keep reading about it. The area I’m writing about is between the Killdeer Mountains and the North Unit of Theodore Roosevelt National Park. It’s home to mule deer, elk, mountain lions, bighorn sheep, sharptail grouse, bald and golden eagles and the ever-more-threatened North Dakota State Bird, the Western Meadowlark. It’s an area we all need to be concerned about. The National Park Service has a good account here. A fellow named Bill Markley retraced the trip in 2010 and wrote about it in True West magazine, and you can read his interesting account here. Or best of all, TR actually wrote the story himself, and it was published in Century Magazine in its May 1888 edition. The Archive of American Journalism has transcribed it in its entirety, and you can read TR’s account here. Finally, getting back to our bridge story, if you want to follow the story of the Bice Bridge on the official BLM website, you can do that here. BLM’s North Dakota manager Loren Wikstrom has told me as soon as the Environmental Assessment is done, he will post a notice of it on this site. Another informative update — thank you! And if there’s advocacy you would recommend, please let us know. I am equally worried about the dust that will be kicked up on the roads that run next to the winter grazing area of the National Park south unit if the oil refinery is built. Not very many tourists see that area because it is far from the frount gate and the roads inside of the park. It is one of the few areas where the snow blows across the open range, leaving open grazing for the large animals. It is also an important area for the birds of prey to hunt for rodents in the winter. With the increase in truck traffic and the dust that comes with it this small but crucial part of the park will be affected. I don’t think this is being addressed by anyone who is granting the permits for the refinery. Another of the tales of how Big Oil takes livable land and makes it a mess, leaving the native animals and people to fend for themselves. Never mind the legalities, it’s one more piece of the race for money, gold, Texas tea that is.